After seeing this image we thought what can we do about it. Well it turns out, we can stop it. Cotton tips are really useful and found in most bathroom cabinets and toiletry bags. Problem is they are a single use plastic and last in the oceans for ever. So we stopped using them, (which is our usual response to things) but still wanted them. Mama Kim came to the rescue by finding Bamboo Cotton Tips. No plastic anywhere, totally biodegradable and with zero waste packaging. Save Seahorses from having to ride the ocean currents on plastic. Changing from plastic to Bamboo Cotton Tips will help Seahorses get back to using the natural sea grasses for the job. Every small change you make really does add up to a big picture difference. Changing your everyday toiletries to eco friendly really does impact the environment and human health. Every morning people are getting up and getting ready for school, work, home life - that’s 8 billion of us. Imagine how many cotton tips are used everyday around the globe! If we all change to Bamboo cotton tips future generations wont know that we used them because they are totally biodegradable. 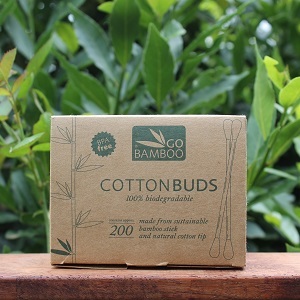 When you have finished with your Bamboo Cotton Bud you simply pop it into your compost/green waste bin or dig a hole in your garden and bury it. Bamboo cotton tips are biodegradable.